How will we know how far we’ve come unless we know where we started? It’s a common question for just about any endeavour, and one that Mission Creek Restoration Initiative (MCRI) partners first asked themselves several years ago. Now, thanks to data collected during the year-long Baseline Biophysical Inventory (BBI), we not only know where we’re at, but also where we should be going and how we might best get there. MCRI’s goals are to restore fish and wildlife stocks, to conserve and expand biodiversity, and to create wetlands and habitat for species at risk. To help meet these objectives, Ecoscape Environmental Consultants studied the current ecological workings of Mission Creek and the surrounding riparian areas between Casorso Road and Gordon Drive in Kelowna. The resulting report, entitled Mission Creek Restoration Initiative (MCRI) Monitoring Report provides a snapshot of existing habitat and the abundance of fish, wildlife, and plants. Along with this important data, the report contains a framework for ongoing monitoring and habitat damage mitigation strategies for the current dike construction phase. Surveys were conducted at regular intervals at assigned locations to look for certain species; different types of surveys were used depending on the species being studied. For example, teams of registered biologists spent 2-3 hours on various nights visiting 17 different locations. At each location they listened for three minutes and then recorded information about what they heard, including direction, distance, numbers, and species. Yes, these folks are so good they can pick out the croak of a Pacific Chorus frog at 100 paces! High-tech equipment also played a part in the surveys. 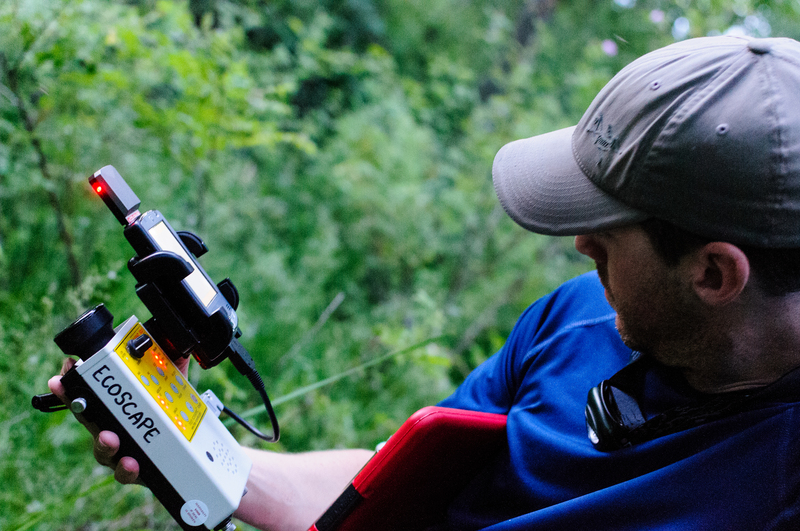 The team used an ultrasonic recorder connected to a hand-held computer to display and record the sonar calls of bats. While this technique does not identify individual species, different families of bat can be identified by their sonar characteristics. Data from these surveys enabled the biologists to create a profile of relative abundance and diversity of species in a total of 30 survey points located throughout the study area. The surveys confirmed that the area is home to 82 bird species, three amphibian species, three reptile species, and 11 species of mammals, along with a number of unidentified bat species. Of these, eight are provincially listed ‘species at risk’ and several others are considered ‘threatened.’ Home can be a relative term through, that varies with the species. For the threatened great basin spadefoot, this area might be the frogs’ entire world. But for the endangered western screech-owl, the creek and its riparian areas might provide only a small yet important part of its overall habitat. The overall area was classified into four groups of environmental sensitivity based on habitat suitability and ecosystem characteristics. While 75% of the area was found to have low value (due to the level of disturbance), almost 18% of the area rated high to very high. This represents about 68 acres of high-value habitat that provides wildlife corridors and maintains high-value ecosystems. Ecosystems are defined by their connections, so it’s important to remember that it’s not just the creek that provides this habitat, but includes the surrounding forest, grasslands, and ponds. For example, the Michaelbrook pond proved to hold abundant life and is an important location in the life-cycle of frogs, insects, and some reptiles. In turn, these critters become a food source for larger species, enhancing the resilience of the habitat. One of the main observations made by the survey team was the high impact of the ‘edge effect,’ where there is a change from one habitat type to another. Moving from the creek bank, across the walking path, and into the adjacent forest is an example of moving through three types of habitat that all have edges where they join. Some species love this edge environment, where others don’t. The challenge with this area is that there are not enough interior habitats away from the edges where certain species can flourish. Information provided by this report will inform planners on which areas need to preserved, which need to be expanded, and how existing edges may be modified. All this information is currently being used to inform planning and development decisions. These include new dike construction plans that will help provide suitable habitat for species at risk and restoring this section of Mission Creek. 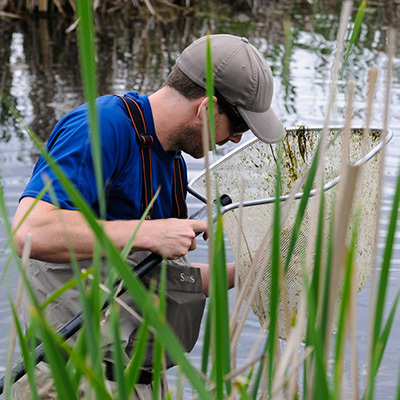 Biologist Kyle Hawes gathered aquatic specimens during a field survey. This information was later collated and helped complete the picture of which species inhabit the area. Using an ultrasonic receiver and data logger, biologist Adam Patterson watched for indications of echolocation signals used by bats to hunt for food. 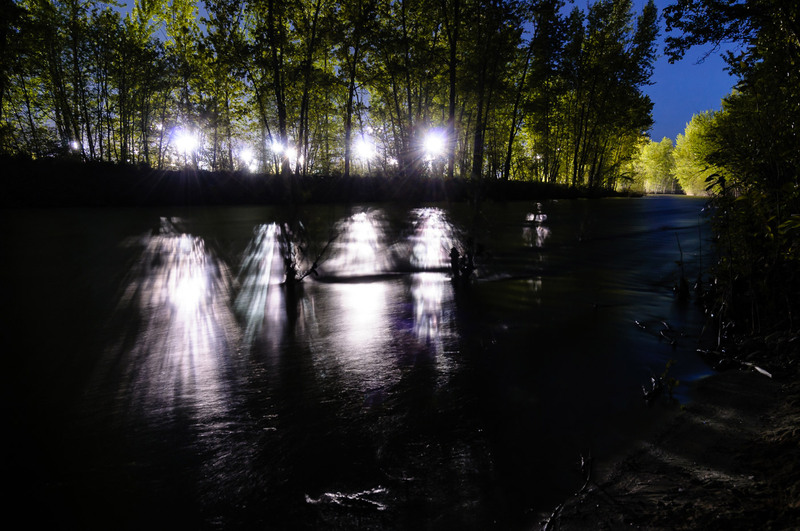 Light pollution is a serious problem for nocturnal species that can lead to increased predation between species, and impact amphibian breading patterns. The above photo illustrates how light from ball diamonds encroaches on habitat around Mission Creek. Endangered: Species facing imminent extinction. Threatened: Species that is likely to become endangered if nothing is done. Special Concern: Species that may become threatened because of current identified threats.